Hull #042by Christensen Yachtsoffers the unique opportunity tobuild& personalize a new yacht with full warranties in time for the Fallof 2019. 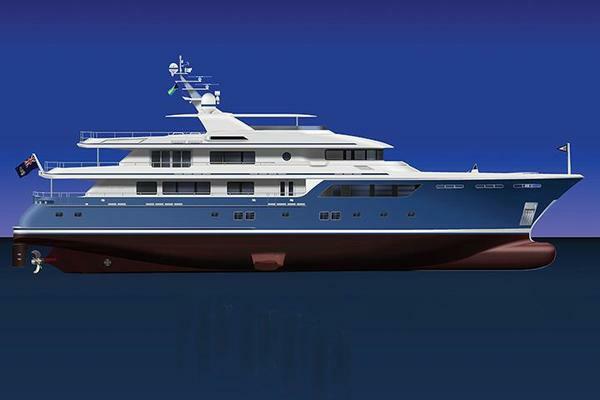 This large volume yacht features Christensen’s latest designdetails& engineering unmatched by her predecessors. Her striking contemporaryinterior décor features accommodations for up to 16 guests in 6 staterooms with a voluminous master suite located on the main deck, complemented by a full width VIP suite and four equally impressive guest staterooms on the lower deck. United Yacht Sales New Jersey would love to guide you through a personal showing of this 164' Christensen Model Year 2019 2018. This yacht for sale is located in Christensen Shipyard / Vancouver, Washington, Washington and priced at $35,000,000. For a showing please contact us by filling out the form on this page and we will get back to you shortly! (2) SeaTel 5004 Sat TV antennas; Functional control of the entire A/V system is through Crestron touch panels located in every room. Each room has autonomous control of the DVD movie library and the CD music library, as well as U.S., Caribbean, and European satellite television. All Entertainment controls, Movie System and receiver equipment is located in a central A/V room and networked throughout the yacht. Hyak Electroworks the programmable logic based system, with (6) 12” color touch-screens installed throughout. A SIMnet integration and monitoring network connects the vessel’s system to allow remote monitoring, data logging, power management and diagnostic. GENERAL The vessel has accommodations forsixteenguests in (6) staterooms and ten crew in (5) cabins. OWNER The Owner’s full width suite is located on the main deck. Owner’s office is to starboard upon entering the master suite hallway, which then leads forward into the master suite. This is a huge master comprising two large walk-in closets, vanity and his/her en suite bathrooms. The room is an elegant mix of fabric panels and satin finished wainscot. GUESTS There are (4) large guest cabins located on the lower deck along with a full beam VIP suite. All (5) cabins have en suite bathrooms with spacious marble showers; the VIP also has a large Jacuzzi tub. Additionally, the (2) forward guest cabins have Pullman berths. CREW There are (4) upper/lower crew cabins forward of the spacious crew’s quarters on the lower deck, plus a large captain’s cabin aft of the wheelhouse, all with en suite bathrooms. Crew access to all decks is via a dedicated crew stairway.